posted: January 21, 2017 by: Shayna Meliker, Vetstreet Tags: "Clinic Specials" "News"
Navigating the pet food aisle can be tricky: A pet food label’s numbers and percentages can easily be misinterpreted, and marketing claims may lack regulatory definitions or objective, verifiable evidence to support them. Choosing your cat or dog's food is a big decision, and one that should be made with your veterinarian's guidance. But it doesn't hurt to know a little about how to decode those labels. The reality is that the “best” pet food is the one that meets the unique nutrient and energy needs of your individual pet's life stage and health status, and that’s a decision you should make with your veterinarian. Check out our gallery below for things you should keep in mind when reading pet food labels. 1. 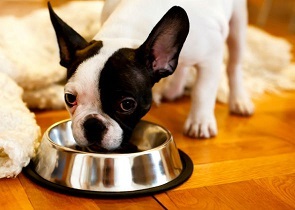 Feed a diet that's right for your pet's life stage. Your cat or dog's nutritional needs will change throughout her life. A good baseline for determining which foods may meet those needs is the Association of American Feed Control Officials (AAFCO) Nutritional Adequacy Statement. The statement will appear on the food's label if the AAFCO has determined that the diet contains all the nutrients in the right balance to meet a pet's nutritional needs during gestation/lactation, growth, maintenance or all life stages. The statement will go on to say that this has been determined based on one of two things: that the diet has been formulated to meet nutritional profiles for the life stage and species indicated or that the diet has passed feeding trials to prove that it provides adequate nutrition. 2. Don't get too caught up in the ingredient list. When it comes to evaluating the nutritional value of a food, don't focus too much on the ingredient list. Nutrients are more important than ingredients, which are just vehicles for the nutrients — and you can't always tell which ingredient packs more nutrients than another. Ingredients are listed in descending order by weight, with many "chemical-sounding" minor ingredients listed toward the end. But Amy Farcas, DVM, DACVN, a board-certified specialist in nutrition by the American College of Veterinary Nutrition, says that "you may not need to be concerned about those ingredients, as many of them are actually essential vitamins and minerals." 3. Understand that byproducts aren't necessarily bad. According to Dr. Farcas, some chemical preservatives have been determined to be safe for animals. So there's not necessarily a reason to discount chemical preservatives outright. Still, if you do make the personal choice to buy pet food with only natural preservatives, ask your veterinarian which kind to feed and how to store it. One example: If you have a small dog, don’t buy giant bags of kibble that will expire before you use it up. 5. Be savvy when it comes to marketing claims. Sometimes clever packaging on pet food touts phrases such as organic, natural, human-grade, premium, holistic or any other adjective you can imagine. But do those terms really have meaning? Dr. Ann Hohenhaus explains that the definition of the term organic is determined by the National Organic Program, which is administered by the United States Department of Agriculture. Natural is more complicated: The AAFCO has a specific definition of the term, but the United States Food and Drug Administration has declined to define it. And the rest of those terms? Some have no agreed-upon definitions at all. So just remember that a food with a fancy marketing claim may not be the best one for your pet. 6. Know that not all types of protein are the same. The protein quantity in the guaranteed analysis can be very misleading. It’s not usually possible to use it to fairly compare two diets to each other. For most healthy pets, a diet that's higher than average in protein isn’t necessarily better than one with an average protein content. It’s not possible to determine the protein content of a diet from the ingredient list. 7. The right amount to feed your pet may be different than the recommendation on the label. Some labeling on pet food may contain instructions on how much to feed, but you should always follow your veterinarian's instructions on the proper portion for your individual pet. Your vet understands how many calories and which nutrients your cat or dog requires. Many vets will make recommendations (or alter existing recommendations) for amounts to feed based on a cat or dog's body condition score.